Ravelry does it yet again. It has made me fallen back in love with a current WIP that hasn't seen the light of day since, hmmm… May 08!? a year ago! It's sat on the top of my WIPs list, yarn under my bed, and mojo out of my sight. I even contemplated using the yarn for something else. And to be honest that is how I came back to wanting to knit it again. The project is the ever popular and oh so cute – Phildar Leaf Pullover, my fav verson – Klement's. I bought several balls in a lovely dark red Aurora 8 and casted on last May. I've already told you how I love the new IK spring and was thinking of using the yarn for the Soap Bubble Wrap Cardigan. Alas, not enough balls! So I went on to that fabulous knitty site looking at what else people have made with the Aurora 8 and there the Phildar Leaf Pullover was yet again. I clicked on one and then another and then another and realized – I Do Still love you! I've been watching a several movies lately that have the supporting all-knowing friend give our hero/herone that whole sideways glance look while saying, "You love him/her!" and our hero/heroine always gives the same response, "Oh, ha. No, I don't. Why… I couldn't possibly…" and the friend just laughs and says "Wow, yes you do!" 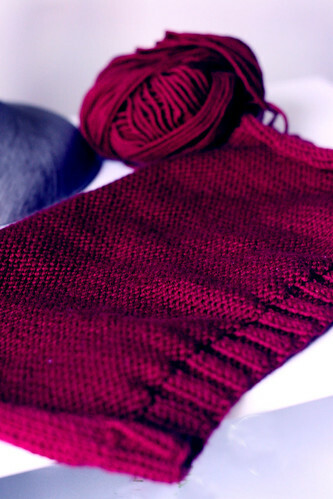 The Ravelry Projects list is SO my supporting all-knowing friend. I'm thinking of ripping and restarting it with the fronts and backs together. Skip that whole reverse stockenette seaming mumbo jumbo – although I'm sure it's Not That Hard. Of course all this will happen when the Minimalist is done!! To realize you want what you already have - woot! Thanks Ravelry! I feel the same way about Ravelry! What? Not enough balls? Not you! This color is very rich and the pattern looks great, very feminine… Could get to my queue as well… Good choice! now that was one love story!! I was tearing up through the entire thing :O) Glad you found true knitterly love ! Yay! Another Ravelry love story!!! i am LOVING the red. I’m sure it will be fabulous! Yes, sometimes your one true love has been right there all along…this is a great pattern! A beautiful pattern for a lovely color 🙂 I’ve like to see pictures of the finished sweater! I was tearing up through the entire thing. Glad you found true knitterly love.